Locke has been enjoying the Nuzlocke Challenge. Basically, what that means is that you’re only allowed to catch the first Pokemon you see in any given zone AND if a Pokemon faints he “dies” and you can’t use him anymore. I’ve been told that the shining star of Locke’s Nuzlocke party is his Sandslash, whose drill pierces any and all heavens. This entry was posted on Monday, January 24th, 2011 at 12:00 am and is filed under Comics. You can follow any responses to this entry through the RSS 2.0 feed. Both comments and pings are currently closed. Keep up hope, you can still try the Diglett Cave for reinforcements! To be honest, its hard but not at all impossible. I’ve lost 5 pokemon so far. I’m actually on Victory Road right now. 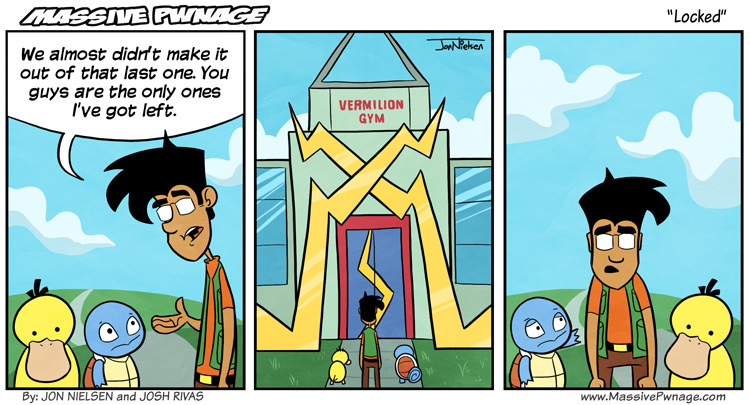 The hard part is that you have to name your pokemon to have a bond to it. So when your Diglett dies, its not just Diglett, its “David”, your friend. T’is a hard road. I can say this is pretty easy, just farm a lot of pokemon and and switch them out on par for whatever type you need. GL on victory road, though. I have gone through the game with my empoleon only dying twice, so it shouldn’t be TERRIBLY hard to just use a few extra potions. I’m running a Nuzlocke run right now. It’s damn hard, and I’m bad at it. I’ve got almost as many deaths as catches, and I only just got to Palkia. I’m too afraid to try it myself, mostly because organizing my team to be perfect is one of my favorite parts of the game. I might come around to it someday though. Good luck with that legendary! I don’t recall Sandslash having a drill. Nice reference though, that was a damn good show. And btw there are many types of Nuzlockes, some going as far as only using pokeballs or like one pot max per battle. Yeah, people love piling on the rules to make it even harder. Crazy! One: typing an e-mail address using only a left hand? Not recommended. Two: It seems that doing a Nuzlocke run alters your judgment on just how much damage a wild level 3 zigzagoon can do. I lost my first two catches when wurmple and my zzg had at least 5 health, maybe more.